For those of us who are on-the-go and do not want to schlep around the entire household, a minimalist wallet is all we need. The Crabby Gear Minimalist Wallet, my dear readers, is how a minimalist wallet SHOULD be constructed! I’d recently reviewed a “minimalist wallet” that completed infuriated me – I’m talking full-on repugnance for a brand that is selling consumers shoddy product. That is so absolutely not what one would say about the Crabby Gear Minimalist Wallet! It is absolutely fabulousness! The wallet fits up to 10 cards, money and has a secure elastic band with rubber griping to keep all of your essentials safe -- including your cell phone! 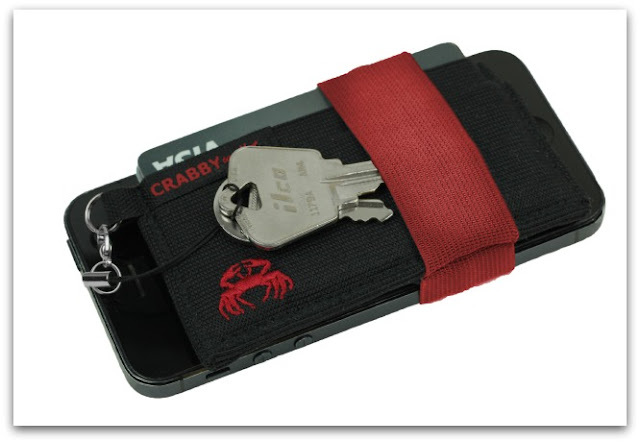 The Crabby Gear Minimalist Wallet also features a removable lobster claw strap so that it can easily be placed on your keychain. There’s actually quite a bit of versatility in this minimalist wallet. With a wide strap around the middle, you can opt to place a key there and go for a run or, again, place the wallet on your keychain and pop out to the store. The design is sturdy and chic. Love it! And is available in Black, Red, Grey, Blue, Green, Orange, Purple, Yellow and Pink … yep it’s a unisex wallet and a perfect stocking stuffer! So, with the Crabby Gear Minimalist Wallet you get superior functionality and an extremely well designed wallet … right down to the embroidered “Crabby” logo. The Crabby Gear Minimalist Wallet lists for $29.95, but is currently on sale for $14.95 on Amazon!